A leaflet sent to Labour Party members from the 2002 Labour Party Leadership contest. It has profiles , provided by the candidates, for both the Leadership and Deputy Leadership Elections. 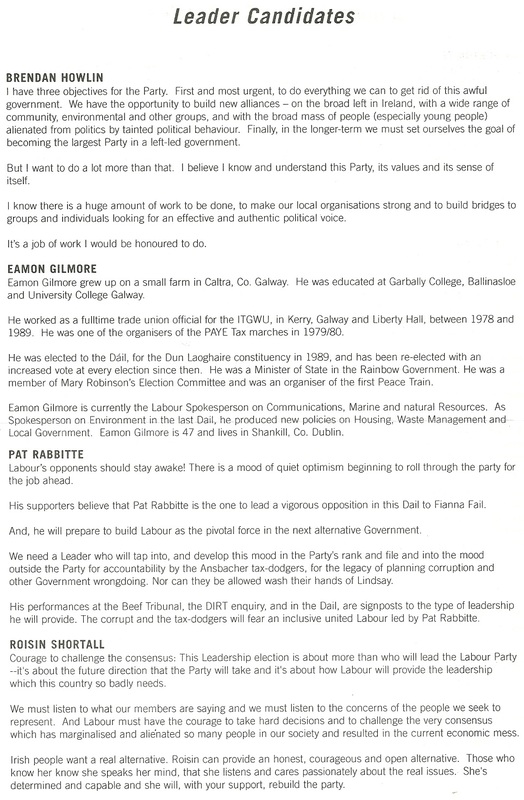 Pat Rabbitte was elected Party Leader defeating Roisin Shortall, Eamon Gilmore and Brendan Howlin. Liz McManus was elected Deputy Leader defeating Joan Burton, Willie Penrose and Joe Costello. 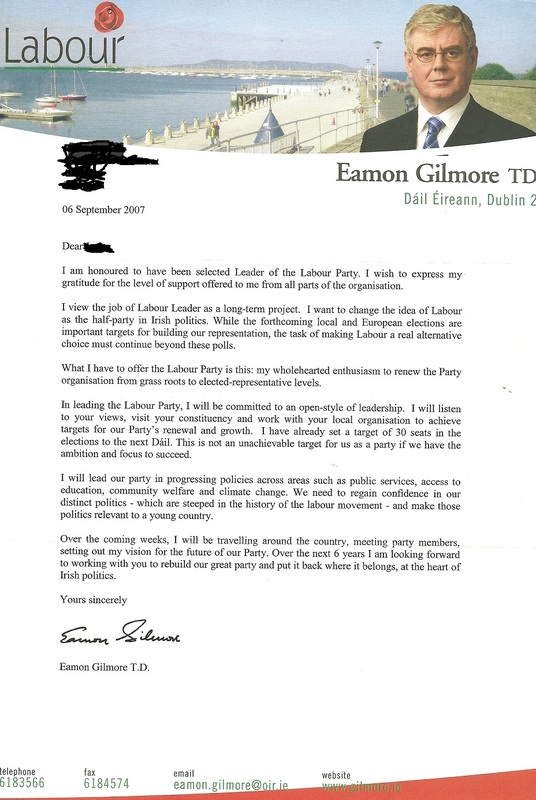 From September 2007 a letter from Eamon Gilmore to Labour Party members outlining his aims for the Party. These aims included winning 30 seats at the next General Election and an open style of leadership. For some reason he also mentions a timeframe of six years. 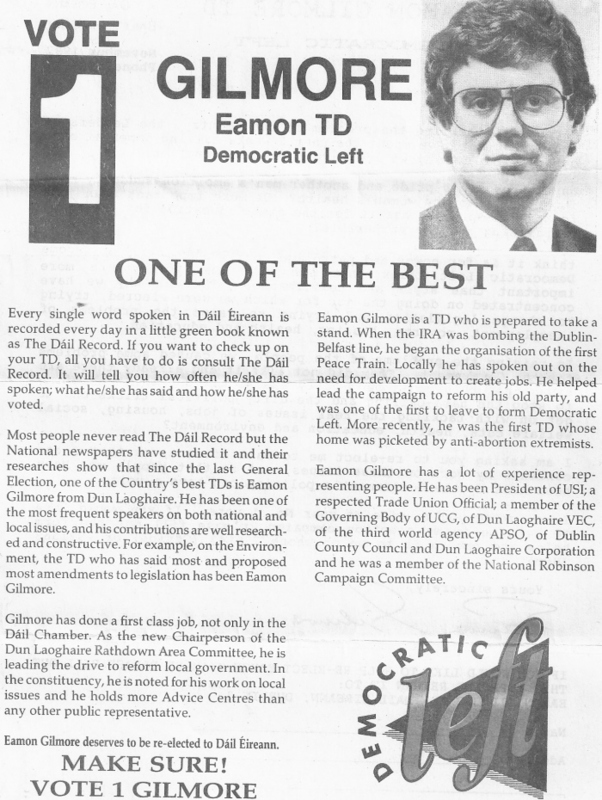 From the 1989 General Election a leaflet from Eamon Gilmore of The Workers Party who was running in Dun Laoghaire. 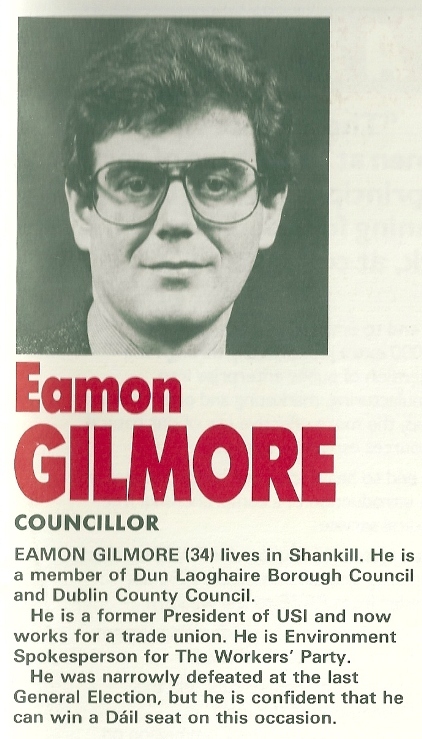 Having narrowly missed out in the 1987 General Election, it was in this 1989 Election that Gilmore won a seat in the Dail for the first time, a seat he has held since. The leaflet itself sets out then then aims of The Workers Party and we also have a message to the electorate from Proinsias De Rossa. The 150 words about local issues in Dun Laoghaire gives an idea of some of the problems of the time. 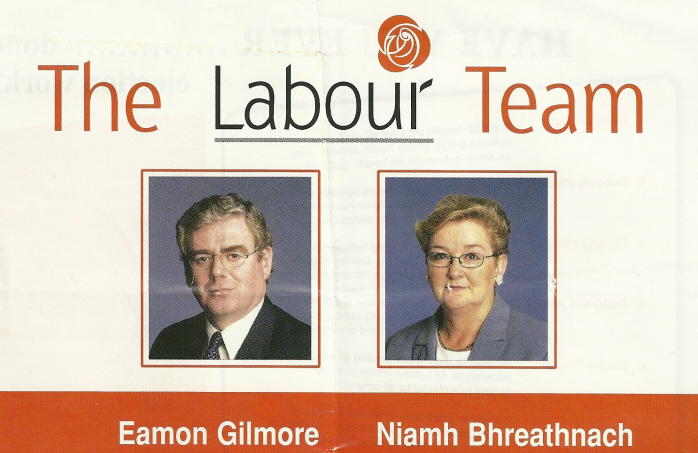 From the 2002 General Election a leaflet from Labour candidates Eamon Gilmore and Niamh Bhreathnach running in Dun Laoghaire. Gilmore polled 8,271 votes and was easily elected. Bhreathnach polled 3,893 votes and missed out. It was Gilmores first General Election standing for Labour. 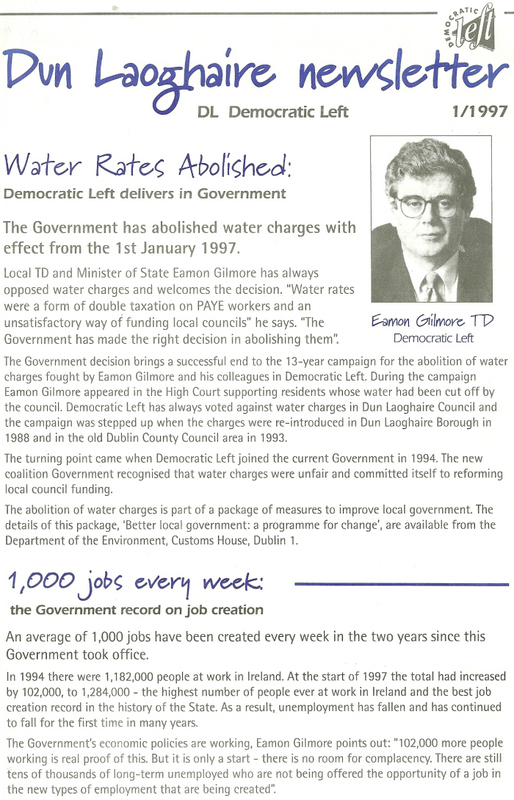 From the 1992 General Election a leaflet from the then Democratic Left TD Eamon Gilmore running in Dun Laoghaire. Some lovely slogans in ‘One of The Best‘ and ‘Make Sure Vote Gilmore‘. We get details of how much Gilmore speaks in the Dail. The Leaflet also mentions that Gilmore ‘began the organisation of the first Peace Train‘. We learn too that “He helped lead the campaign to reform his old party, and was one of the first to leave to form Democratic Left” (Should read to form New Agenda which became Democratic Left). Gilmore was elected easily having polled 7,045 votes.